Camelot and the National Lottery are now an integral part of British life, not only the Lotto game but also the Scratch cards are key areas of business. 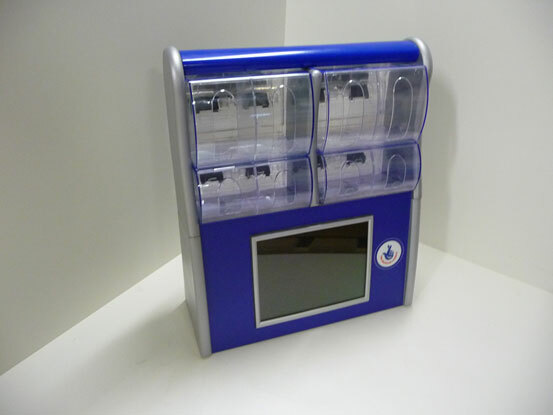 We were approached to provide a coating to the role out of a redesigned display stand to be placed on shop counters throughout the UK. Due to the substrate selected for this project. MDF Powder Coating was the only choice for this project. In excess of 80,000 parts were needed for this major role out, therefore the ability to have a finished component painted and packed in approximately on hour was key. High volume through put and a coating that is consistent uniform and durable was also demanded by the customer. The customer once the parts had been cut and prepared were transported using our fleet of vehicles both to and from the supplier. This project at the time represented the largest single MDF coating request we had dealt with at this point. In excess of 80,000 parts were produced and painted by us. By utilising our flexible and willing staff and equipment we were able to keep to a strict and regular delivery schedule. In addition through close partnership with our suppliers we were able to ensure reliability and backup for the customer. Once this project was completed we have continues to supply additional powder coated parts for ongoing developments and changes to the display stands.